Dogwood trees (Cornus spp.) 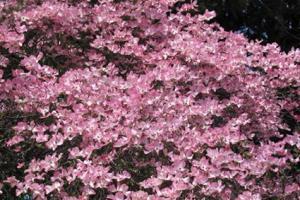 are one of the quintessential flowering trees of spring. There are several popular varieties available - choosing one depends on where you live in the country and the unique context of your home landscape. The various species of dogwood differ somewhat in appearance and growing requirements, but there are number of things that characterize them as a group. 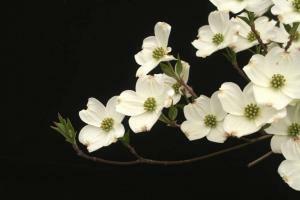 Dogwoods are small trees by nature, rarely growing to more than 25 feet in height. In the wild they grow as understory trees, meaning they are best adapted to cool, partly shaded conditions. Most will tolerate full sun without a problem in places where summers are not scorching, but in truly hot climates it's best to give the afternoon shade. 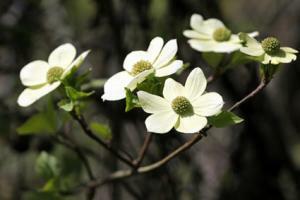 Dogwoods like the rich, moist, slightly acidic soils found in the hardwood forests of their native habitats. Mimic this in the garden by incorporating ample organic matter into the soil prior to planting and maintaining a thick layer of mulch over the root zone. Regular irrigation is essential during dry periods. 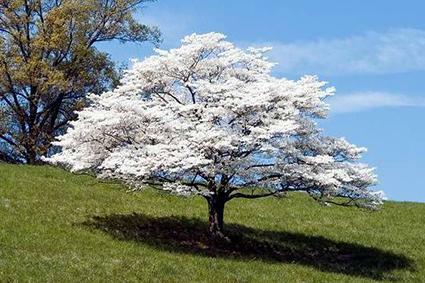 Dogwood trees are noted for their prolific spring flower displays and ornamental form, making them ideal candidates to use as a focal point in the landscape. For example, in front yards they can be planted in the center of a bed of perennial flowers near the entrance of the home. They are small enough to be considered backyard patio trees as well. Plant them six or eight feet from the edge of a patio or deck to give a little shade and privacy around outdoor seating areas. There are five commonly grown species of dogwood, each with a unique ornamental form. Flowering dogwoods (Cornus florida) ares hardy in USDA zones 5 though 9 and are known for their large white blossoms in early spring. The blossoms of many flowering dogwoods are tinged with pink and there are some cultivars that have entirely pink blossoms. The flowers are followed by red berries, which birds adore. They are not poisonous to people, but are unpalatable. The large oval leaves are deeply veined and turn a beautiful shade of red before dropping off in the fall. This variety is found in the forests of the southeastern United States and is one of the most popular ornamental trees in that part of the country, but is widely grown in other regions as well. It's easily found in most nurseries. It is the only dogwood that thrives in hot, humid climates, though it still needs afternoon sun and ample irrigation to perform well. The biggest drawback of this variety is its susceptibility to disease - especially an incurable form of anthracnose that is prevalent in some areas. The Kousa or Japanese dogwood (Cornus kousa) is hardy in USDA zones 5 to 8 and closely resembles the flowering dogwood though it is native to Asia. It flowers later in spring and has slightly smaller leaves and blossoms compared to the native southeastern variety. It is notable, however, for being resistant to anthracnose, so it is usually the top choice where this disease is a problem. It also has much larger fruit than the flowering dogwood, which is edible for both people and birds. Kousa dogwood can be found in most nurseries across the country. Pacific dogwood (Cornus nuttallii) is the West Coast representative of the dogwood clan and is hardy in USDA zones 7 to 10. It is more drought tolerant than the other species though it has not been bred as extensively for its ornamental traits and is not commonly used except in native plant-themed landscaping. Order one from Las Pilitas Nursery. 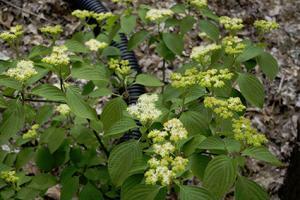 Its flowers are quite small, but it is very disease resistant and is the only dogwood that grows well in dry climates. It is the tallest of all the dogwood trees and can eventually grow to more than 25 feet in height. Cornelian cherry dogwood (Cornus mas) is native to Europe and is quite different from the other species in that it has small yellow flowers. These appear on the bare branches in late winter and make up for their small size with their great numbers. It is hardy in USDA zones 5 to 8 and is the smallest of the dogwood trees, straddling the line between a large shrub and a tiny tree. Its tiny fruits can be eaten but are usually eaten by birds before they are noticed by people. 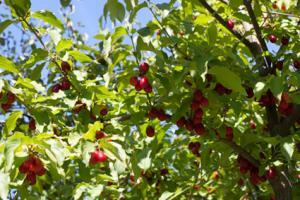 Find Cornelian cherry at Monrovia. The pagoda dogwood (Cornus alternifolia) is native to much of eastern North America and grows in USDA zones 3 to 7, making it the most cold hardy dogwood tree. Forestfarm at Pacifica sells a three to four foot sized pagoda dogwood. It has clusters of small white flowers in spring, but is known more for its unusual growth habit - the branches grow in distinct horizontal layers around the trunk of the tree, resembling the layers of a Japanese pagoda. Other than in extremely arid desert regions, there is a dogwood tree available to suit the conditions faced by gardeners in any part of the country. There is also a surprising diversity of forms beyond the common white dogwood flower that most gardeners are familiar with.